Panera Bread Macaroni and Cheese has to be one of my favorite side dishes at the Panera Bread Bakery. It is rich, creamy, and irresistible. You can make some yourself with this recipe. If you are lucky, like me, you live near a Panera Bread. If you don’t live near one, you have to drive far, or you can recreate this recipe at home. I can help you make a bowl of their delicious macaroni and cheese. 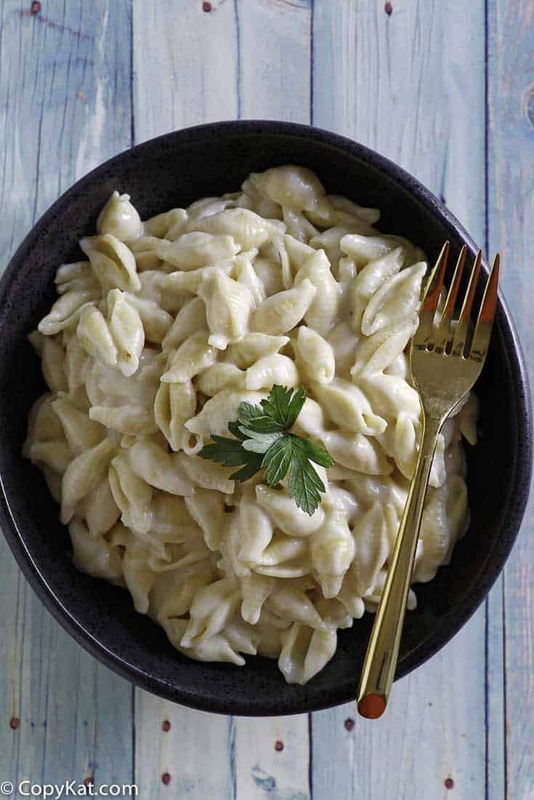 What makes this recipe unique is that is it so creamy. A lot of macaroni and cheese seems to barely have enough cheese. Here the pasta is enrobed in white cheddar cheese. You might wonder what makes this so creamy. This recipe is made by using a combination of white American cheese, and sharp white Cheddar cheese. This combination works well. As there is no cheese like American cheese that melts into a rich creamy sauce, but the sharp American cheese is what makes this delicious. You can buy white American cheese at the deli section of your local grocery store. Walk up to the deli counter and ask them for about a pound of the cheese. You can let them slice it any way you like. You are going to melt the cheese so sliced or not it doesn’t matter. I like to use about a pound of the American white cheddar and about 1 cup of sharp white Cheddar. That isn’t the real secret to the recipe; it is the Dijon mustard. Mustard has a way of enhancing the flavor of the sharp cheese. Mustard gives it a little extra punch. I like to use a good two teaspoons for this recipe. I also thin the cheese sauce a bit with whole milk. So all of the ingredients are common and easy to find. I cook up a whole box of pasta shells. If you can’t find pasta shells you can use any other type of pasta that you like. Macaroni tastes just like the shells. I hope you give this recipe a try. If you like Panera Bread recipes, be sure to check out these copycat favorite recipes. Prepare pasta according to the package directions. Make the sauce while the pasta is cooking. 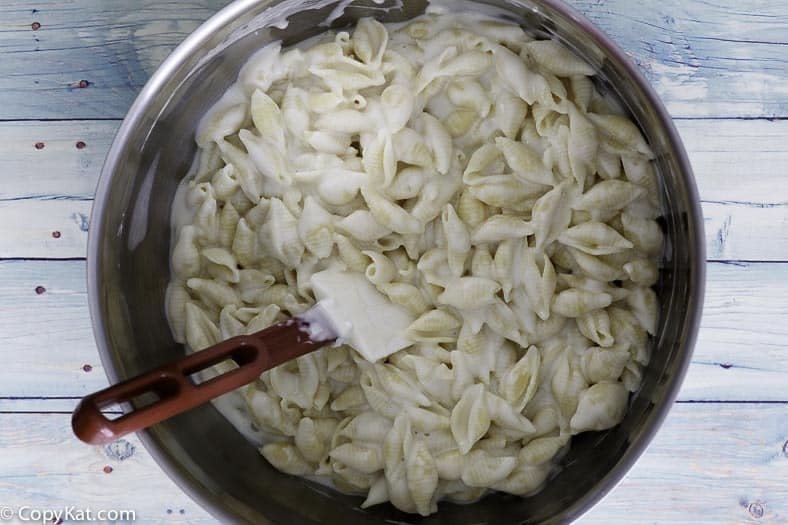 Make a basic white sauce by melting the 3 tablespoons of butter, add the flour, and cook over medium heat for about 1 minute. Then slowly add in the cold milk, and stir the sauce until it is thickened. Make the sauce while the pasta is cooking. If the white American cheese is not sliced, cut it into cubes. In a medium-sized pot add the American cheese and as it begins to melt, slowly stir in the milk. Once the American cheese has fully melted, begin to stir in the white sharp cheese. Stir in the Dijon mustard. The cheese sauce should be ready the same time the pasta is done. Combine the cheese and the pasta together. Serve immediately. Is there mustard powder in this recipe? I thought the Dijon mustard was prepared. My family loved this! Thank you for sharing! I see twice where you use the milk. once added to the flower then later to the cheese. How much milk did you use in each? I think the second time the milk is added it is the flour, butter, and milk mixture. We made it tonight it was fabulous!! I used heavy cream …& aged boars Head cheddar in 1/2 and cheaper cheddar!!! YUM!!! I tried this as posted. I’m happy with the creaminess and the taste, mostly. I will still keep using it, for it’s a great dish. However, It’s a bit bland in comparison to Panera’s. Unsure of what else it needs. I added cumin, that’s not it. In different bowl, I tried paprika, not it. There is a smoky, saltier flavor in the real deal. Any trials done that match it better? I would go with a little more mustard powder. You may want to consider that your cheese is not the same brand that they use. A dashor two of hot sauce really helps. A dash of nutmeg and more dijon. I am confused it is on this web page. I’m making this for Thanksgiving and I wanted to prepare ahead of time. How long can it stay refrigerated and what’s the best method for reheating? I would reheat this on the stovetop by adding more milk to this. The white American cheese in this will make it a bit gummy. If the stove being used is an issue, you could try reheating this in a slow cooker (it will take a lot longer), again add some milk. For two people, I’m going to divide the recipe in half to avoid over-eating and left overs … do you see an issue with that? Dividing it in half should work just fine.